the image indefintely!) you'll see five starlings IN the birdbath, one on the ground, one robin waiting in line and another robin standing slightly back of the bath, watching. Two flickers had just left. Until today I don't remember seeing more than 2 or 3 small songbirds or a robin in the bath at once. So this was pretty extraordinary. There hadn't been any starlings around the yard for over a month so I suppose these young guys were on their way somewhere, saw the birdbath, and decided to fly in for a quick visit because it's been so dry lately. 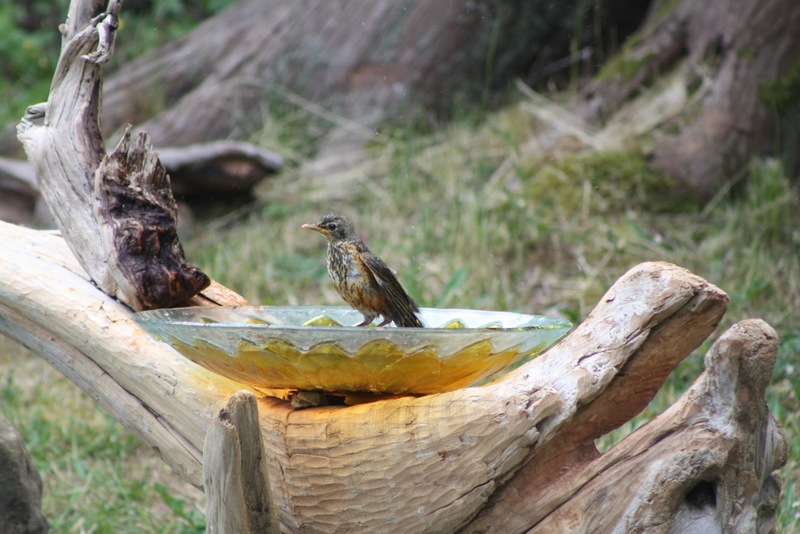 Certainly both our birdbaths have been well-used, much more so than usual, over the past couple of weeks. So I'm refilling them every morning with the water we collect in a bucket as the shower water warms up. I kind of like the idea that I'm passing on my shower water to the birds for their shower during this October dry spell. If you have a bird bath, please remember to keep it full and clean right now.